todays' technology is just amazing. earlier this year we [scotty and I] got back in touch via email...…. 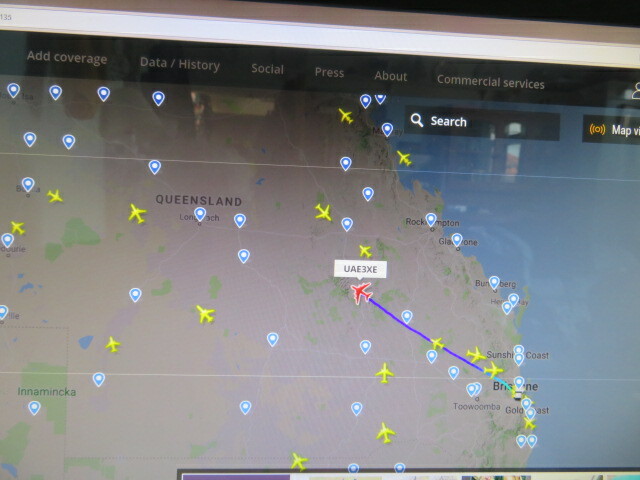 and this morning I shared, [if only via the internet] their take off together from Brisbane airport, via technology.....amazing and marvellous. I was E-Mailed out of the blue a few weeks ago by my ex-wife's son (by a previous marriage). He had Googled my name and "model aircraft kits" and had found me via my involvement with Component Shop. He wanted to know if I still wished to establish contact with my daughter - last heard of/from 35 years ago when she was not quite 3, and very effectively 'firewalled' ever since by her mother. To cut a very long story short I'm now waiting to have Claire's E-Mail address confirmed and that she wishes to resume some form of contact. I gather things are looking quite positive. I now live in the same hope that I'd abandoned years ago. I am so happy for you dave, and I really hope that things go well for you both, and your son as well...…..it would be a lovely start to the year for you. I honestly feel great pleasure for you and may you regain some of the years you sadly lost because of vindictiveness and sad intentions by another person. good luck mate...., my best wishes go to you all. Thanks, Neil, but the guy is actually no relation to me - it's just that my daughter is unfortunate enough to have the same mother as him! He also seems to be a bit at sea with the technique of sending, receiving and forwarding E-Mails, but I'm sure we can overcome that. good luck mate, hope it all pans out well for you.